In the political battlefield of Washington, D.C., respite seems called for—and Take Care is offering it. 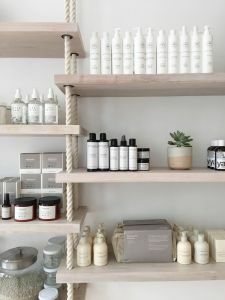 From accomplished clean beauty merchant Becky Waddell, the new 1,200-square-foot wellness and personal care shop on Georgetown’s Wisconsin Avenue spans skincare, bodycare, makeup, fragrance, nail and home with 25 brands in an environment designed for decompressing. She worked with interior designer Veronica Revilla to develop Take Care’s inviting minimalist setting, incorporating Kuzeh Pottery light fixtures, The Forest Fern macramé lanterns and Fajen & Brown custom furniture. Be Clean, a 120-square-foot nook on the third floor of a century-old building dedicated to artist studios, was the precursor to Take Care. Waddell opened it in 2014 to be a showcase for natural skincare she had collected initially to satisfy a personal preference for vegan beauty brands. She supported herself with a full-time job while operating Be Clean, which shuttered she finally ended in January. Be Clean shuttered around two months ago. The first time Waddell entered the location that’s now Take Care she instantly fell in love with the natural light flooding it and the modern brick structure housing it. There was one problem: the store was taken. Waddell moved on, but was a bit heartbroken. Soon after came news that a previous deal and fallen through, and she snapped up the location. “Everywhere else was tiny, closed-in boxes, and we’d have to put in all this artificial lighting. We are lucky to have found something that’s naturally beautiful on its own,” says Waddell. There’s no track lighting, and it’s roomy enough for classes, a point of emphasis at Take Care. The shop will host book readings, wellness speakers, yoga sessions, and meditation and makeup workshops. Two tables in its space are intended for class use. Waddell believes Be Clean’s clientele, primarily women in their 20s and 30s discerning about skincare ingredients and often prone to sensitive skin, will be Take Care customers. Students from nearby Georgetown University and shoppers in the neighborhood for retail therapy will undoubtedly drop into the store, too. Waddell also predicts people interested in natural products from throughout the D.C. metro area will patronize Take Care because clean beauty destinations remain rare in the region. Demand for natural deodorant has, in particular, led the clean beauty curious to check out Take Care. The shop carries Erbaviva and Meow Meow Tweet natural deodorants. In addition to Meow Meow Tweet and Erbaviva, it stocks the brands May Lindstrom, Gressa, Laurel Whole Plant Organics, Strange Invisible Perfumes, Vapour Organics, Herbivore Botanicals, Lilfox, Smoke Perfume, Mischo Beauty, Drifter Organics, Raaw in a Jar, Henné Organics, Axiology, Essential Apothecary Alchemist, Habit Cosmetics and Sundays.